…and 5 extra kilograms since August, but that’s another story. It’s been 3 full cycling seasons since I started this journey of ever-lowering stems, hill repeats and learning to love my Zone 4. I’ve just completed Haute Route. What the heck could possibly top that? Nothing, you’re right. But anyway, a guy needs goals, so here goes. This will be my 3rd year doing the Etape and 4th one in total. The Etape will forever be close to my heart. You never forget your first multi-Alpine col race, do you? Happily, it’s also a very cool event, with closed roads, guaranteed epic routes, and all the carnage and suffering you could ever dream of. This should be the main event of 2014 and will depend on how efficient my water boy/girl is during #1 above. Plus my training, I guess. If I don’t qualify in St. Tropez in April I will either put this one off for another year or find another qualifying race in a country with weaker riders! This year it’s different. In previous years I had only one main goal, and all my training for the many months preceding were just geared to getting me ready for it. Everything else – at least in theory – was secondary. The first long approach from Grenoble to just past Bourg-d’Oisans is my winter of indoor suffering. Risoul is the ‘Worlds’ in Slovenia. It’s a long way from Grenoble to Risoul, with many ups and downs along the way, it seems. But I’ve really got to lose these 5 kilograms. It must be done. So what are you doing in 2014? 5kg!!! Gerry, you are a regular Jan Ullrich. I thought I had put on close to a 1.5 kilo but as it turned out I hadn’t. But you have perhaps answered the question on how to justify a new bike – set a goal. So I tried it out on my wife and she said “yeah you do need a new bike”!! Hold it. That was too easy. There’s got to be a catch? Anyway, goal setting. Very important. You may see me at the Gran Fondo. If I recall, when you did it, it was horribly cold and wet, or was that a different race? Okay maybe closer to 4, but it’s still a lot. I am following a long history of putting on pork in the off season. Bernard Hinault, for example, was famous for starting spring training in horrible condition. I’m just following cycling tradition! Nice work on the new bike, but better check and see if that ‘yeah’ comes with any ‘but’s! There’s always a catch, in my experience. No, the weather in Saint Tropez has been great the two years I’ve done it. Fingers crossed for one more. Gerry, you have a lot longer view than I do… I think I might skip Paris-Roubaix next year, but the other Spring Classics are firmly in my mind. 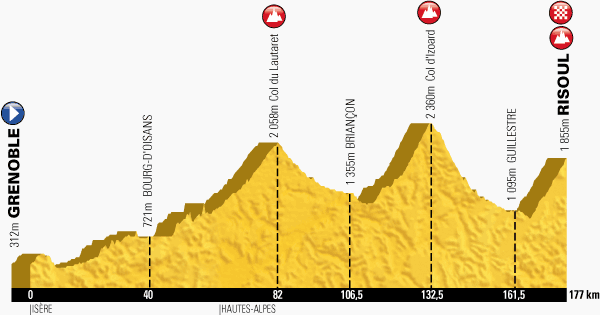 And, I am very tempted by the route being discussed for September in the French Alps. Other than that, I have not really thought about anything. Yet. No longer view, Chikashi, just have to book hotel rooms before they’re all sold out! I’d love to get up and do either P-R or one of the other Classics sportives. Make sure you post when you sign up. I need the motivation. What is this mysterious French Alps route you mention, by the way? Forclaz, Montets, Megève, Madeleine, Glandon, Alpe d’Huez, Ornon, Parquetout, Cayolle, Valberg and a few minor lumps adding up to 13.900 m of elevation gain. Yes, I’ll post when I’m signed up. RvV and L-B-L are high on my list, but it will all depend on whether I am disciplined enough to keep my legs warm over the winter… Easier said than done! Sounds like a nice romp through the Alps. I’ve actually a good portion of P-R and it was one of the weirdest experiences I’ve ever had on a bike. That’s nuts, but it somehow reminded me of the Maratona dles Dolomites…so I pre-registered for that. Thanks! And, yes, P-R is definitely worth doing at least once in one’s life. However, I would not even consider doing it if the ground is wet — too dangerous. Is St. Tropez always the qualifying race or did they announce the list and I missed it? It’s only an assumption on my part right now. I haven’t seen any list yet either. It’s been the race for the past two years, though. Hope it is again. I am going to get all my exercise vicariously (as the actress said to the bishop) by following your breathtaking exploits from the comfort of my armchair. My sole target will be to bicycle 100 miles at least once during the year…..and lose 3kg. Good goals, and not that easy, if you lose (or don’t, I guess) weight like I do. I might have to give up on the Etape. Can’t find a hotel within 20 km of Pau right now! I like your plan of no plan, Jan, but I don’t trust myself to train properly without an objective, so had to get that out of the way early! I’d kind of like to see what gains I can make next year, too. Want to keep the momentum moving while I can. But you are totally right: what I liked with HRA is that I had the clearest training goal ever and with it came great focus. No pain, no gain. Beer played its role, yes. My goal is not to fall off my bike after drinking beer, keep my weight at its present level, and do a few 100 mile events-where? Depends where I’ll be at the time. Bottom line is to enjoy cycling and the freedom it brings. What else is there? Good goals, especially the beer one, and especially if it’s your new bike! Good luck finding a Century where you live. Maybe ask Jonathon? I know he’s done some riding in Malaysia and Thailand.